The Icelandair business class meals have had some improvements including a new range of pre-order meals for business class customers and some changes to the inflight service and meal choices. I take a trip from London to Reykjavík and return to Amsterdam to see what’s the latest in Saga Class and Economy Comfort dining. You can read about my previous experience in Saga Class, gone are the crisp white tablecloths and the meal choices. It seems a little more relaxed and more like sitting in an upmarket cafe that offers the latest in food trends. 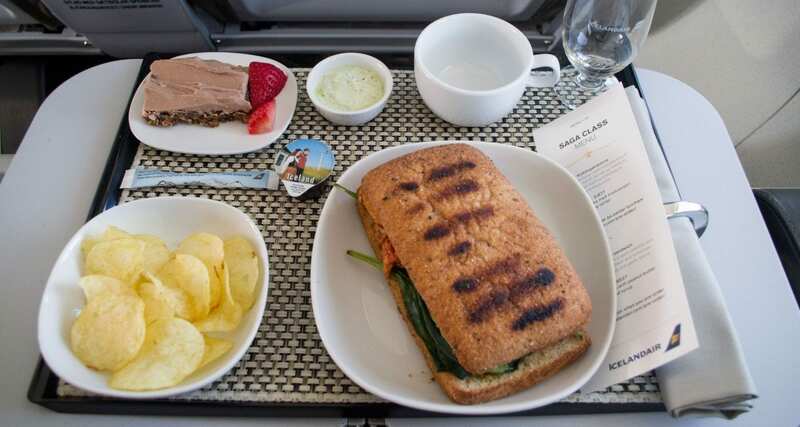 On the business class menu today between London and Reykjavík is the Chicken spelt ciabatta bun with red curry, spinach and tomatoes served with a raw food cake with peanut butter, and a plate of crisps. Bread can be a funny thing at 35,00ft, but the ciabatta bun was served crisp, hot and full of flavour. My favourite part of the meal was the delicious raw food cake which was fresh and mouthwatering, something that you would expect to be served at your local cafe. 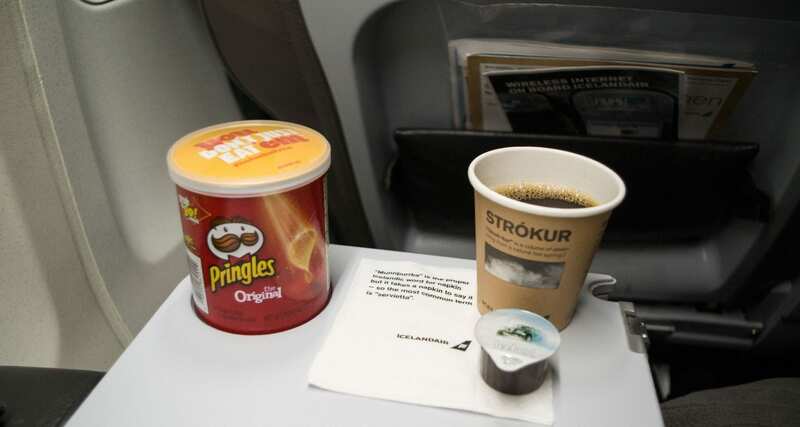 Perhaps many may question the above meal as being substandard in a business class cabin however it’s worth noting that the airline does give you the opportunity to pre-order, (what you would like to eat), from a range of truly unique Icelandic dishes. A few days later I flew back on Icelandair in Economy Comfort (which the airline has since removed from all aircraft) to Amsterdam. Economy comfort passengers can select whatever they want from the Icelandair Buy on Board Menu at no cost. This time things were a little different though, when I was served I was given no choice of meals, instead just given coffee that I requested and a packet of Pringles. I thought it was a little odd so I waited about 15 minutes and then asked if it was possible to purchase some oats for breakfast. My request though was never followed up, and in the end, I gave up wanting to chase the cabin crew for the breakfast order.